Nintendo may be fighting an uphill battle to garner public support for its 3D-capable handheld in its native Japan. Whether you like playing games on handheld platforms or no, you can't deny that Nintendo's DS has been an unstoppable force this generation. It's easily the most popular gaming platform in the world - and arguably the most popular platform of all time. Of all time! (Thanks, Kanye). 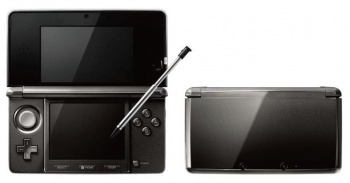 The 3DS, on the other hand, might face some heavier opposition thanks to a price tag of Â¥25,000. Nintendo has a long road ahead of itself, too - two recent surveys in Japan find that not only have many Japanese not heard of the device, the ones that have think it's on the pricey side of things. Japan's Nikkei Shimbun newspaper and online research firm Macromill found that out of 1000 respondents, 55.9% hadn't heard of the 3DS - and a similar number said that they had no interest in the handheld. 36.9% knew something about the device, but only 7.2% said that they were completely up-to-date with all there was to know about the 3DS. This doesn't seem to just be Nintendo's problem, though, as 57.8% of respondents said they knew nothing about Sony's push for 3D-capable content on the PS3. It's unclear whether the people surveyed were just gamers or covered all walks of life - if the latter, this may not be quite so bad for Nintendo as it appears at first glance, but I'd wager it's still not what the hardware giant was hoping to hear. A second poll asked 1,003 respondents whether they felt the 3DS' Â¥25,000 price - the same as the original PSP and the Wii - was expensive or cheap. Nearly 80% of respondents said that it was expensive: 32.2% called it "somewhat expensive," 28.3% said that it was just plain "expensive," and 19.2% answered that it was "too expensive" for them. Meanwhile, 16.4% said they felt the price was "reasonable," 2% called it "somewhat cheap," and 1% and 0.9% of the respondents said that the price tag was "too cheap" and "cheap," respectively. That may include Sonic creator Yuji Naka. There's no question that it is a high price for a handheld, but Nintendo hasn't had a loser in the portable market yet (barring the Virtual Boy). Japan went gaga over the DS, and, while its successor may have trouble getting a foothold, it's by no means out of the race.